With PCS orders in hand, your mind is racing. Do you sell your home or rent it? What happens if you list now and sell early? What if you wait and don’t sell or rent the property until after you’ve already moved? Where do you begin? The moving process can be overwhelming. Add selling a home to your list, and you’re probably ready to pull out your hair. While you’re justified to feel overwhelmed, there are a few things to keep in mind that will help ease the process and keep you moving at a smooth pace. Understanding your housing market will help you have the right expectations going into your home sale. Research comparable listings in your area. A real estate agent or REALTOR® will already have this information, but if you choose to do a For Sale By Owner (FSBO), you’ll need to budget some time for this. Find out what features other homes have, the price they’re listed for, and how long others sat on the market before they sold. This serves as a reality check for you to ensure that you list your home at an appropriate asking price and will help you to sell within a reasonable amount of time. Take a look at the latest Real Estate Trends. You’ll find the average price of homes and the average amount of time similar homes spent on the market in your area. For example, so far this year the average home in the San Diego area sold for 654K after being on the market for 44 days. The average home near Jacksonville, North Carolina sold for 186K and was on the market for over 100 days. Clearly, these numbers fluctuate by location, so it’s important that you know what to expect in your area. From this information, you can assume how long your property will sit before you find a buyer, which can help you decide how early you should list your home prior to your expected move date. 2) Understand how home buyers house hunt. Technology is continually advancing, which changes the way the home buyers search for properties. The National Association of REALTORs® (NAR) released the Real Estate in the Digital Age 2017 Report which provides some helpful statistics regarding the average home buyer in the recent housing market. This data conveys the importance of the internet in today’s housing market. It not only affects the way home buyers house hunt, but also the amount of time it takes to sell a home. Since most buyers find their homes online, you’ll likely sell faster when you invest in an online and mobile-friendly listing, such as those on MilitaryByOwner. 3) Know how to list your property. Your listing serves as the first impression for your home, so it’s important that you not only include stellar details of the property, but that you also know where to place your advertisement to gain the most traffic. When you create a listing for your home, be sure to include features that will stand out against your competition. Provide a thorough description and include excellent quality photos--remember, the majority of home buyers find photos helpful! You’ll also want to keep in mind the property’s location. Include surrounding points of interest, such as schools, thriving businesses, churches, and libraries in your listing because they may help your home sell or rent your property quicker. You’ll want to invest in an online advertisement. MilitaryByOwner’s focus near military installations and easy to use website and mobile app combine to create a great resource to reach the military community. The Home Tour Plus package is the best value for your money. However, after you take into consideration your current needs and location, you may find that one of MilitaryByOwner’s other advertisement packages will work just fine for you. 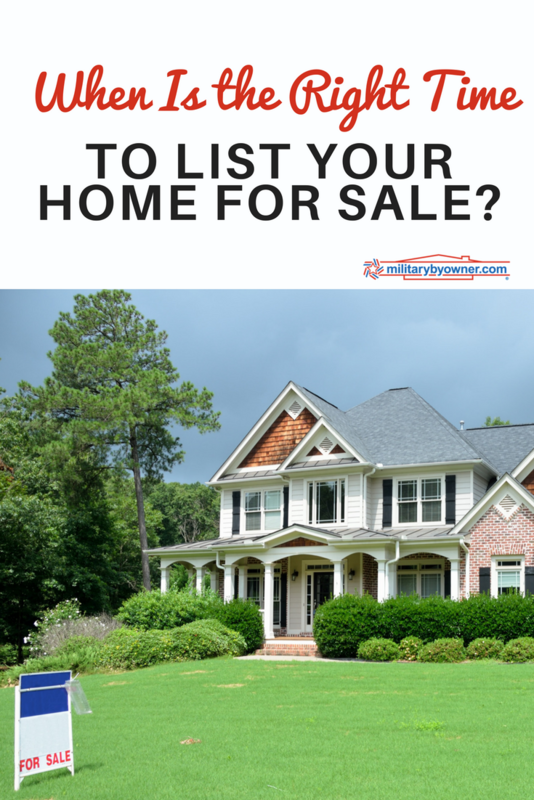 The best answer to the When is the best time to list my home for sale? question is really now. With PCS orders in hand, you’re likely left with a few short months to sell or rent your home. If you happen to find a buyer before you’re actually ready to move out, then you can either negotiate to stay in the house longer, or move out and sublease from someone else until you’re ready to PCS. Moving out early can be easier than PCSing before your property sells. The great news is, spring is the best time of the year to list your home for sale, and it’s often the same time that military families receive orders to PCS. As soon as you get orders, get to know your housing market. Determine how your property compares to the competition and get your advertisement out there for home buyers to see! Use the helpful tips below to further determine your home's value, and then copy and past the text in the box below to share this image on your own site!